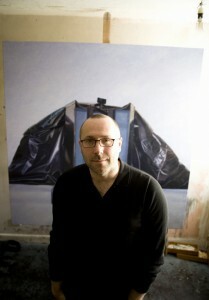 The artist Geraint Evans is interviewed here by Robert Priseman – founder of The Priseman Seabrook Collections. 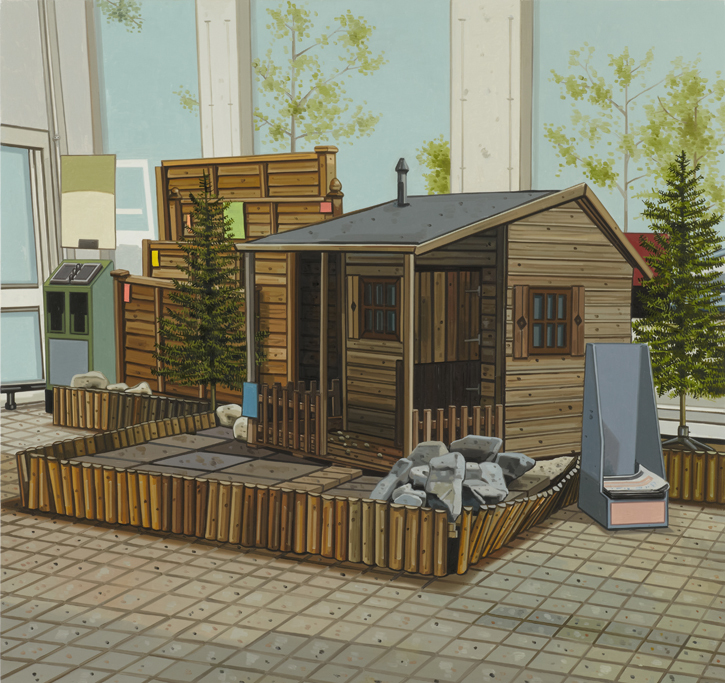 The two discuss the influence of suburban Wales, Canadian mountain landscapes, and Ladybird Books on Geraint's paradoxical, illustrative and humorous artwork. Robert Priseman: At the heart of all of your work seems to be a paradox. We are looking at something, such as a figure in the landscape or a hut by a tree, yet when we look closer we notice that the landscape is probably an artificial backdrop, or the tree an artificial Christmas tree. What is it about creating visual contradictions that appeals to you so much? 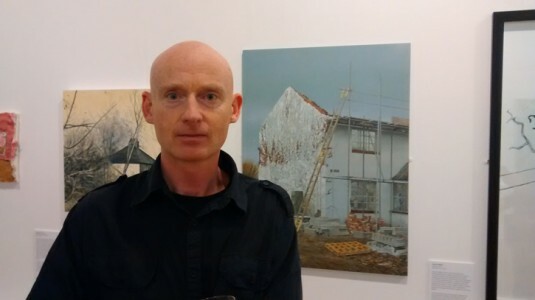 Geraint Evans: On a basic level, I am interested in surprising and unexpected juxtapositions and how they might confound or challenge our perception of the world. This approach can also generate humour in the work. Some of these juxtapositions are pure inventions and so I have depicted an active volcano in a theme park ride or hermits lurking in suburban driveways and gardens. Others, such as a giant redwood tree trunk elevator in a department store were observed at first hand. This playful simulation used to be in a Mothercare shop in the Purley Way, Croydon – a signifier of a vast, wild landscape in as urban a setting as you could imagine. I think that it is the landscape of suburban Swansea – the suburban outskirts where the built and natural environments meet – rather than a truly ‘wild’ Welsh landscape that has had a more significant influence. For some time now, I have been interested in the ways in which we encounter and perceive the natural world, particularly from an urban-based position. Landscape is always viewed through a cultural lens and we constantly seek to manage, shape or even simulate the natural world. Our experiences are often mediated by tourism and our perceptions shaped by historic and cultural conventions. I am interested in how this manifests itself in gardens and national parks, theme parks or even in the high street or shopping mall. This naturally creates some fascinating ‘visual contradictions’ as you put it. Robert: You grew up in Wales, which as we know has a beautiful and ‘wild’ landscape containing many mountains and stretches of coast and which is visited by many tourists each year. I feel that where we come from, the very environment itself, helps shape our cultural identity. Do you feel that the landscape and environment of your youth has had an influence on you as an artist and the paintings you produce? Geraint: I moved to Swansea when I was one year old. Both my parents are Welsh speakers – my mother grew up in rural West Wales and my dad in a small pit village called Garnant. Welsh culture had a major influence on my work when I was a student. 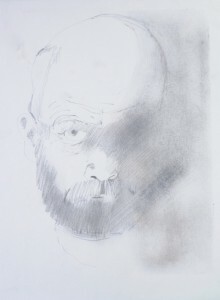 During my BA in Manchester I drew upon the poetry of Dylan Thomas and Vernon Watkins and the paintings of Ceri Richards. I think that immersing myself in the culture of my hometown helped me make sense of leaving home and establishing a sense of my independent identity. Not long after I left college, I decided to turn my attention to other things but the influence of Wales is still there with references to the Big Apple snack shop in the Mumbles, a car park at the foot of Snowdon, an end-of-pier amusement attraction in Llandudno, the dinosaur park in Dan-yr-Ogof, and a model village in Anglesey. I think that it is the landscape of suburban Swansea – the suburban outskirts where the built and natural environments meet – rather than a truly ‘wild’ Welsh landscape that has had a more significant influence. When I look at your paintings I’m most reminded of stained glass windows, but interpreted as a secular and ‘existentialist’ twenty-first-century art form. Robert: How fascinating to hear about the way you have engaged with these multiple external factors in developing your own visual language. I notice in looking over your work that your painting appears to have undergone a fundamental shift around 2002. After this date, your paintings become more richly textured in terms of both their visual and intellectual content. Can you tell us why? Geraint: It is interesting that you should say that. I actually think the shift came about three years earlier in 1999. It was at this time, quite by chance, that I began to use the photographs that I had taken during a residency at the Banff Centre for the Arts, Alberta, Canada in 1994, a year after graduating from the Royal Academy Schools. The Centre is situated within the Banff National Park, a visually stunning mountain landscape that contains some of Canada’s most celebrated natural sights such as Lake Louise and Moraine Lake. The residency had been a wonderfully stimulating experience but I had needed time and distance to understand how to respond to the landscape within my practice. 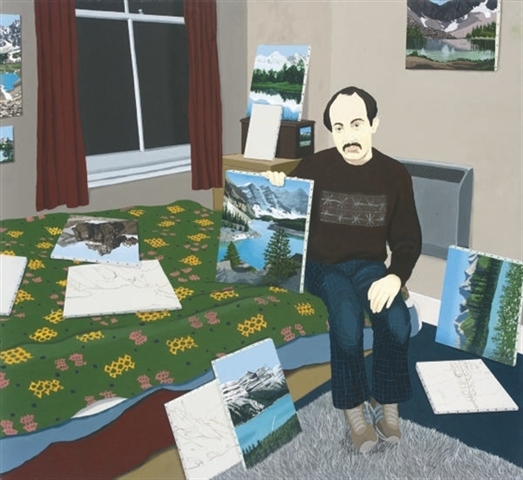 Terry, painted in 1999, depicts a fictional amateur artist in his bedsit room making paintings of the Rocky Mountain landscape that he will never visit. The pictorial language of the painting is deliberately flat and stylised and has something of the Sunday painter about it. 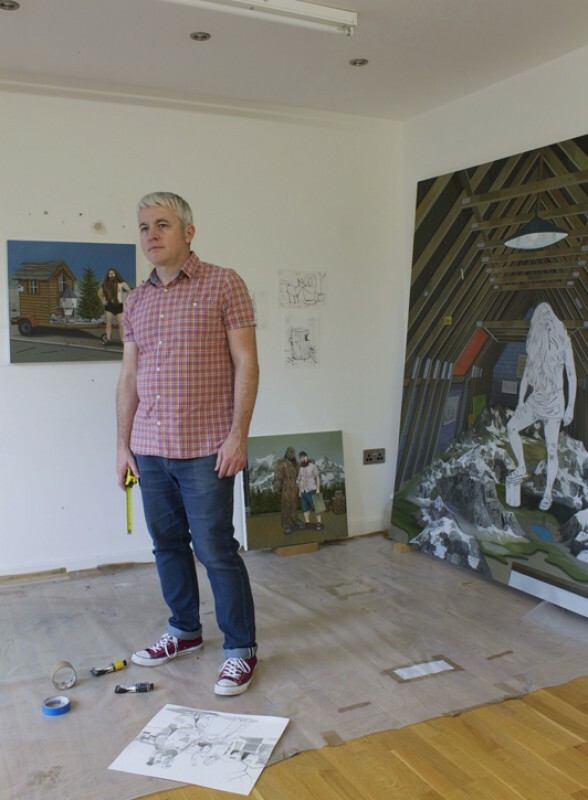 I put a number of my interests and experiences into the painting – from the trip to Banff, to working as a picture hanger at the Mall Galleries, which hosted exhibitions by a number of curious art societies such as the Royal Society of Marine Artists. 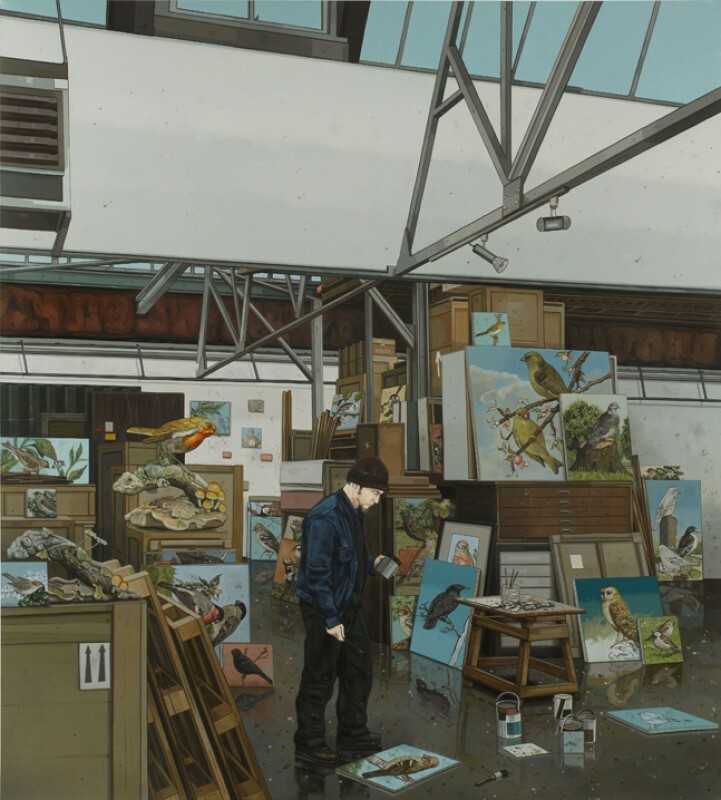 I was interested in the hobbyist, in suburbia and the portrait, and in many ways this is a self-portrait as I found myself painting the same idealised and distant landscape again and again. Robert: When I look at your paintings I’m most reminded of stained glass windows, but interpreted as a secular and ‘existentialist’ twenty-first-century art form. What is your feeling about that? Geraint: I had never thought of it in those terms. Perhaps this has something to do with the work’s appearance – its seemingly flat surface and stylised pictorial language? This developed from an interest in illustration whilst I was still at college – from Ladybird Books, to Victorian medical illustrations, to the diagrams in contemporary health and safety manuals. The Ladybird Book illustrators are, of course, universally admired and illustrators such as Harry Wingfield have had their work shown in galleries such as the New Gallery Walsall. In comparison, the illustrations in health and safety manuals seem more functional and didactic and yet they are designed to illustrate moments of trauma and panic. Again, I find this paradox interesting and a little absurd. 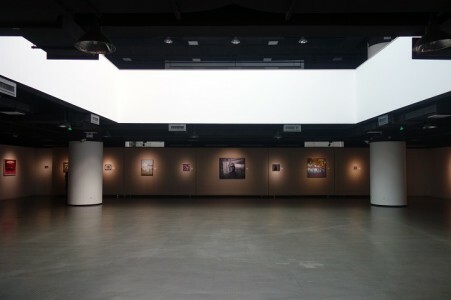 The work’s use of narrative and the direct approach to composition may also have something to do with it. I have painted the hermit, a traditional subject for religious painting, a number of times. Although I am interested in the very many depictions of Saint Jerome in art history for example – Saint Jerome in a Rocky Landscape attributed to the studio of Joachim Patinir in the National Gallery collection is one of my favourite paintings – it is the ornamental hermit that fascinates me. The ornamental hermit emerged in the eighteenth century as a result of the English landscape garden tradition. As the name suggests, they were not real hermits but were employed to live within the grounds of country estates, within purpose-built hermitages and grottoes, to appear for the amusement of the owner and guests. I continue to find this a fascinating subject. 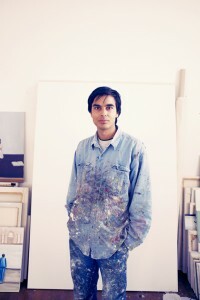 Robert: Which painters do you tend to look to most for inspiration? 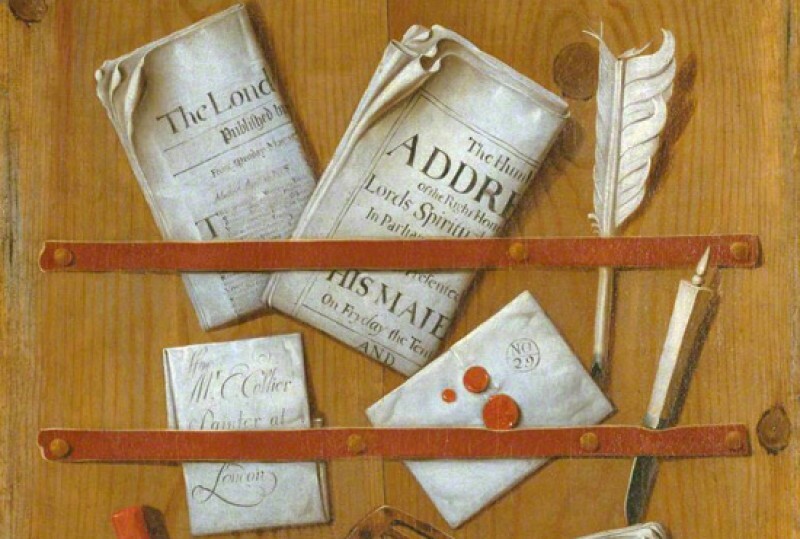 Geraint: The David Hockney retrospective at Tate Britain recently reminded me of how important he had been to me when I was a student, whilst historic artists from Van Eyck to Zurbarán to Velázquez are important to me. More apposite are the Hudson River School – Thomas Cole, Frederic Edwin Church, Albert Bierstadt, Thomas Moran – whose work was presented in the exhibition ‘American Sublime: Landscape Painting in the United States 1820–1880’ at Tate Britain in 2002. 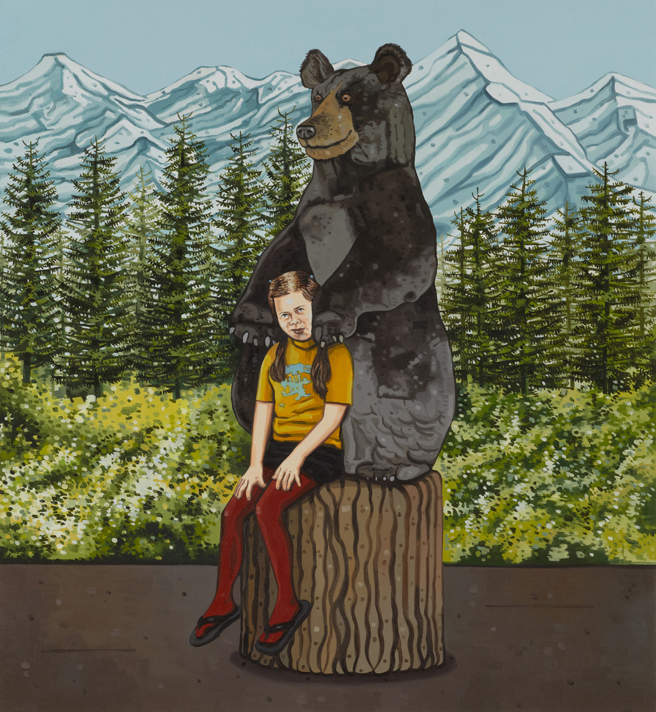 I remember this show as a real revelation that opened up lots of ideas about the ways in which artists picture the natural world and how the landscape can be seen in political terms. 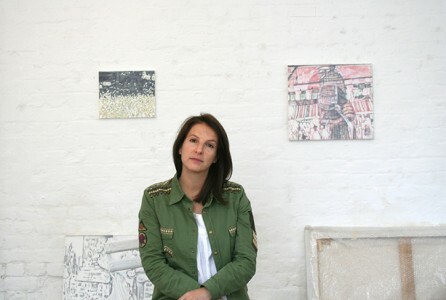 I regularly reference a catalogue in my studio by Tilo Baumgärtel to remind me of the sort of artist that I often feel I would like to be – with his endlessly inventive and idiosyncratic world, expressive paint work and evocative use of light and colour. Robert: It is easy to see from this roll-call of artists how realism, colour and drama are all key influences in your practice as a painter. I also noticed earlier how the unexpected juxtapositions you create in your painting can often generate humour. For an artist, humour is a difficult line to walk, yet one you walk very successfully. The humour you employ is strangely subtle and disconcerting and if anything, I would describe it as being quite surrealist. What do you think of this description? 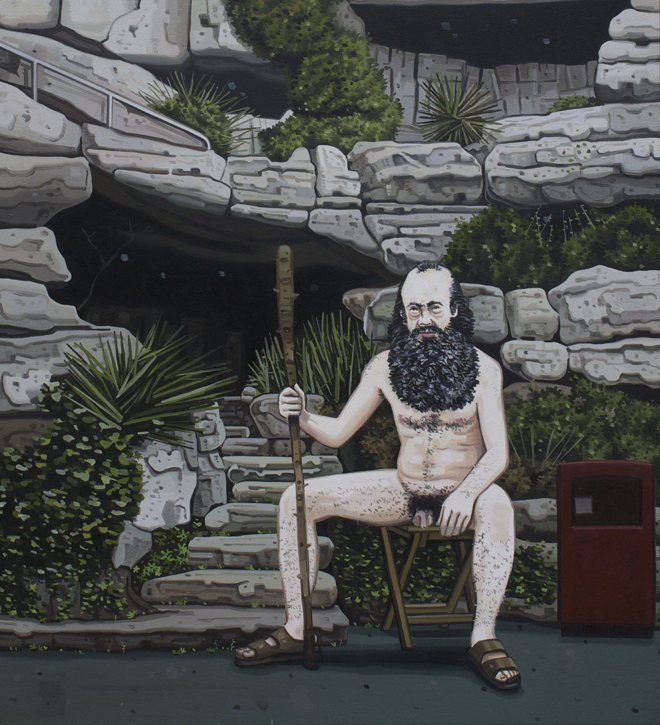 Geraint: I agree that there is an absurdist quality to the humour employed in the work. This is created by the ‘visual contradictions’ or unexpected juxtapositions that you mention. As I have said before many of these juxtapositions are invented but are based on things I have observed. 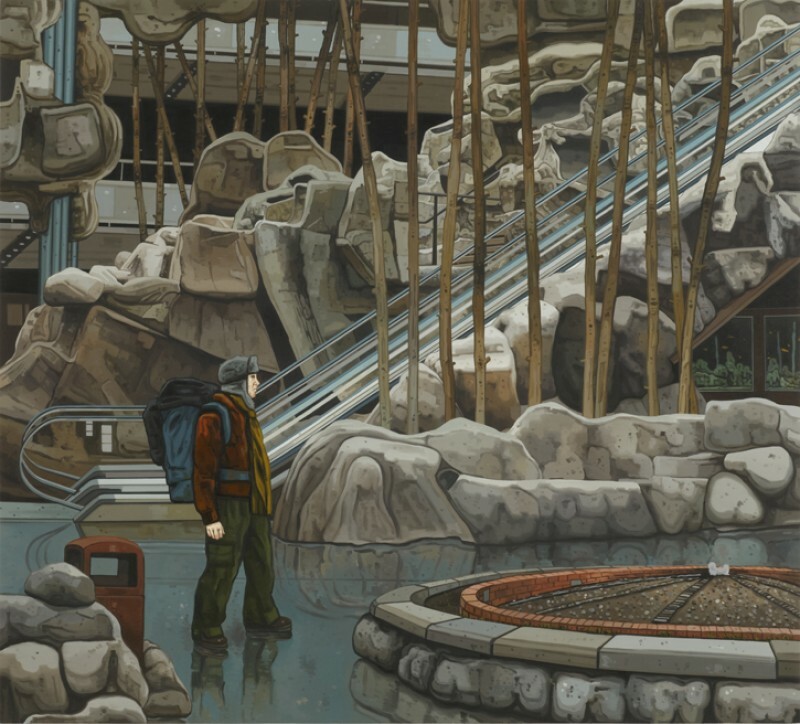 We tend to accept quite absurd things within the right context: waterfalls in shopping malls or swimming in an exotic ‘lake’ beneath the glass dome at Center Parcs. In Disneyland you can ride a roller coaster through Everest or watch animatronic bears play country music. But it is the focus that art brings to these things – the way it holds them up to scrutiny and draws our attention to their absurdity that creates the humour. Robert: Thank you so much for sharing some of your thoughts and ideas with us Geraint.